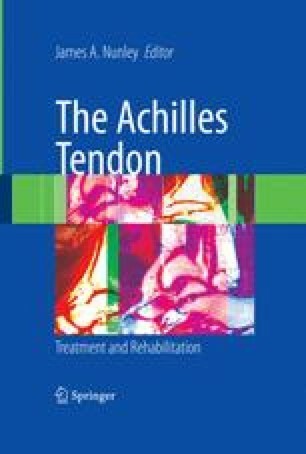 Though an increasing number of reports in the recent literature tend to favor operative treatment of a fresh rupture of the Achilles tendon,1, 2, 3, 4, 5, 6, 7, 8, 9, 10, 11, 12 the exact type of operative procedure and the postoperative regimen remain controversial. Many investigators favor a formal operative approach to secure the best possible repair with the least chance of rerupture. Soft tissue concerns have led others to plan such a procedure only for the professional or high-level athlete, while planning a percutaneous procedure for others. 3,6 Ma and Griffith 13 developed such a technique and reported good results in 18 patients. However, there appear to be two problems with their approach. One is its potential for sural nerve injury. And two, since there is no open incision as the tendon ends are brought into apposition, the quality of the repair cannot be confirmed visually.